Tubing Dimension/Size: 3/8", 1/2" , 3/4"
Thakur Engineering & Maintenance Services Pvt. Ltd.
JOB WORK OF REMOVAL OF TUBES, INSERTION OF TUBES AND SUBSEQUENT EXPANSION OF TUBES. With the help of our expert team members, we have been able to provide Heat Exchanger Retubing Service. 5. Annual Rate Contract for Exchanger Retubing for Bharat Petroleum Corporation Ltd, Kochi Refinery. Work included Retubing of Floating/Fixed Exchanger Bundles, Removal of old tubes, shell cutting, retubing and testing. We offer this service for both “U Tube and Straight Tube equipments. 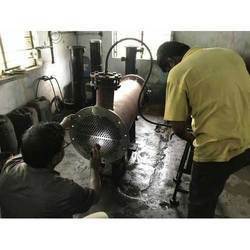 We have highly qualified, skilled and experienced Engineers and Technicians to carry out Removal of Old tubes, Surface Preparation of Tube Sheets, Insertion of New Tubes, Flaring, Bell Mouth, Tube to Tube Sheet welding to the customer’s requirement. 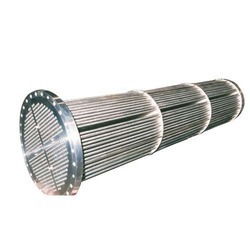 Tube Bundles are critical part of Heat Exchangers used in D.G Sets, Air/Gas Compressors, Chillers, Condensers, Etc. Problems such as Scaling, Oil Sludge, Rust, Etc. results in repairing / replacement of Tube Bundles. FLOWLINK provides assistance in repairing / replacement of old Tube Bundles. New Tube Bundles can be supplied in Tested & Assembles form, to fit old shells.